If you are in need of professionals to undertake garden waste removal in Sydney, then give us a call. We are a professional rubbish and waste removal company who operate all over Sydney, and garden waste removal is one of our services. We not only undertake the Sydney garden waste removal for you, but we also correctly dispose of all the rubble and debris, leaving you with a clear sense of a complete job done. We take on all sorts of Sydney garden waste jobs, such as small demolition for out buildings, shed clearances, garden clearances, and garden waste removal. We also dispose of everything in the correct way, according to the material itself, and recycling everything we can. 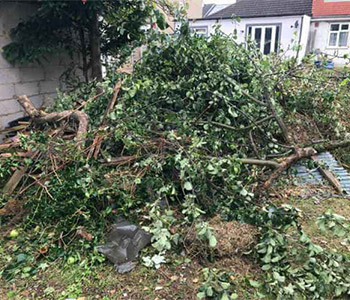 Because we have a wealth of experience in garden waste removal, we are able to carry out this job effortlessly, and safely, and leave you with a tidy site. We also have the experience and the man power to carry out this job at speed, and so it will be done for you when we say it will be done. We have a friendly and hardworking team, who are experienced in clearing green waste, and understand the best way to remove garden waste. All our staff are approachable, friendly, and can help answer any questions about the services we provide. Get in touch with us by phone or email, and our friendly customer service staff will be able to advise you on a price and a time that is suitable for us to undertake your garden waste removal. We always aim to work within the customers specified deadlines, and hold customer satisfaction as paramount, so please just get in touch.